NEXTRA Rigid-flex PCB Design helps users to design rigid-flex printed circuit boards within a 3D mechanical context. 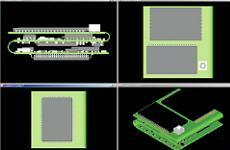 Native 2D PCB design data can be imported into NEXTRA and used with imported native 3D mechanical data in one view. After defining the real path for the rigid and flexible parts of the PCB the flattened PCB data can be exported as native data back to the original 2D layout system. Rigid and flexible areas will be identified by area rules in the 2D layout system. This work flow simplifies the design process, because of the virtual mock up of both different design formats in one design context.